Create a new clock with a specified period. Activates this clock object, by inserting into the simulation's timeVortex for future execution. Return the time of the next clock tick. Add a handler to be called on this clock's tick. Remove a handler from the list of handlers to be called on the clock tick. Called to signal to the Simulation object to end the simulation. 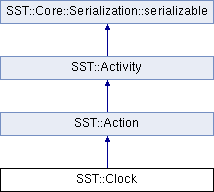 References SST::Activity::getDeliveryTime(), SST::TimeConverter::getFactor(), SST::Activity::getPriority(), and SST::Output::output().